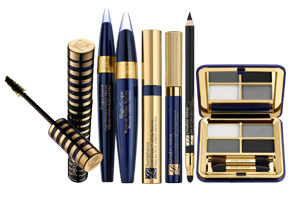 Now beautifully bold, dramatic eyes are just a wave of the wand away. Don't be shy, make your eyes the center of attention with Estée Lauder's new Blacker Than Black eye collection. This unique collection features five of Estée Lauder's most popular mascara formulas each in a richer, more concentrated, more dramatic shade of black for eyes that appear bigger, bolder, more dramatic! Double Wear Zero-Smudge Lengthening Mascara in Blacker Black offers dramatic length and sensationally long wear in one effortless stroke and won't budge, smudge, smear or flake for up to 15 hours. Sumptuous Bold Volume Lifting Mascara in Bold Black turns even your sparsest lashes into daringly full, lavishly lifted lashes without the clumping, spiking or weight normally associated with volumising mascaras. Projectionist High Definition Volume Mascara in Jet Black envelops each individual lash with high volume and exceptionally sharp definition for a sleek, striking look. The Blacker Than Black collection of mascaras is perfectly complemented by Estée Lauder's new Signature Eye Shadow Quad in Black Smoke. This dramatic eyeshadow quad includes four beautifully rich shades to create the perfect smoky eye. The eyeshadow features a silky, microfine powder that won't crease, gliding smoothly onto lids and blending seamlessly for a flawless look that stays-true all day. Packaged in a signature navy blue compact, this attractive compact can go anywhere for a glamorous day-to-night transformation. Instantly frame eyes and complete the look of rich, smoky intensity with Estée Lauder's Double Wear Stay-in-Place Eye Pencil in Onyx. This pencil's unique lightweight, creamy formula glides on effortlessly for rich, stay-true color that sets in seconds and wears for 12 hours.